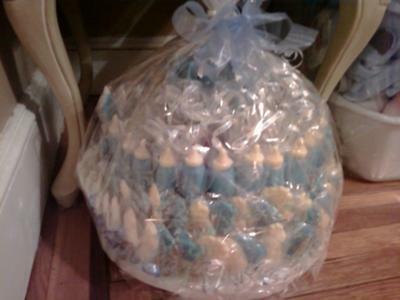 I made this lollipop cake and these chocolate covered pretzels for my grandson's baby shower, then I made them again for my friend's baby shower, and for Christmas. Now I'm having another grandson, so once again here I go. I also do the molded lollipops and the cupcakes and the chocolate covered marshmallows, but how long in advance can I make them? Will they last as long as the pretzels? 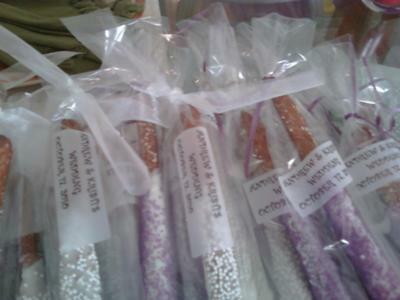 Thanks so much for adding the photos of your Lollipop cake, the chocolate covered pretzels for the baby shower favors and wedding favors, etc. You do beautiful work! I'd love for you to tell us more information about the Lollipop cake especially. Could you describe how to make it so that others could follow your step by step process and make something similar? That would be great! Can you give us an estimate of how many chocolate covered pretzels you are able to make per pound of chocolate that you use? Thanks so much! The chocolate covered marshmallows should last as long as the pretzels, just be sure that you cover the marshmallows entirely for the best shelf life. 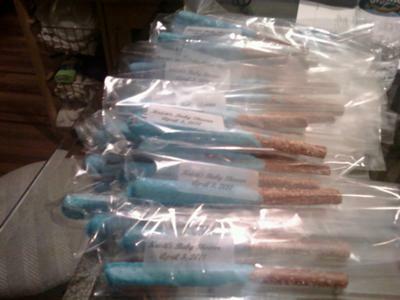 The molded lollipops should be fine for several weeks as well, maybe even longer if they are stored properly. I'm not sure what you mean about the cupcakes. Are you talking about making just regular cupcakes with icing on top? If so, they will have the shortest shelf life. 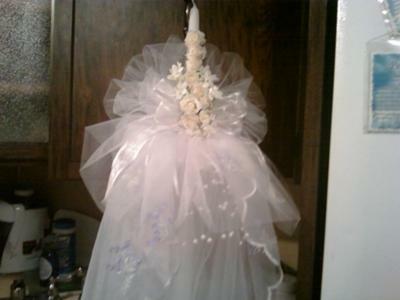 I wouldn't want to make them too far in advance because the cake would probably dry out. I'd probably only stretch it to a few days, if necessary, and be sure that they are stored in an airtight container. If you are referring to some other type of cupcake (a candy perhaps? ), please do explain and we'll see if we can get some better answers for you. To reply to add the instructions for making your lollipop shower cake and the info on the pretzels, just click on the comments link below. I can't wait to see what you make next!